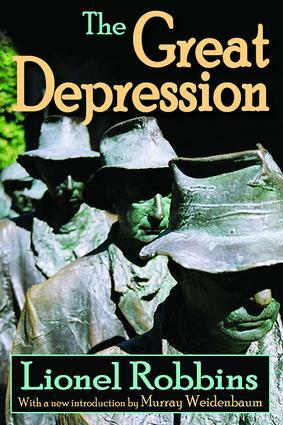 This book examines the nature and the causes of the 1929 depression, tracing its background and the broad conditions from which the depression emerged. As an infl uence on economic activity, Robbins sees World War I, and the political changes that followed it, as a series of shifts in the fundamental conditions of demand and supply, to which economic activity had to adapt. Th e needs of the war had called a huge apparatus of mechanical equipment into being, which the resumption of peace rendered in large part superfl uous. The war also disrupted world markets, and its settlement created conditions that aggravated this disruption. Th us, the struggle that was to end nationalist friction in fact gave nationalism new scope. The depression of 1929 and beyond dwarfed all preceding economic disruptions, both in magnitude and in intensity. In 1929 the index of security prices in the United States was in the neighborhood of 200-210; in 1932 it had fallen to 30-40. Commodity prices in general fell by 30 to 40 percent, and in some commodity markets the drop was even more catastrophic. Production in the chief manufacturing countries of the world from 30 to 50 percent, and the value of world trade in 1932 was a third of what it was three years before. Worldwide, something like 30 million people were unemployed. There have been many economic downturns in modern economic history, but never anything to compare with the years of the Great Depression. Few books have conveyed that period with greater clarity and precision than this masterpiece by Lionel Robbins. Murray Weidenbaum's masterful new introduction adds to its contemporary value.